By Matt Reimann. Jul 12, 2017. 9:00 AM. In 1955, writer Kay Thompson and illustrator Hilary Knight published Eloise: A Book for Precocious Grown-ups. Interestingly, as the original title suggests, the Eloise books were first marketed to adults—perhaps it was an early sign that they would be a hit with children, as well. 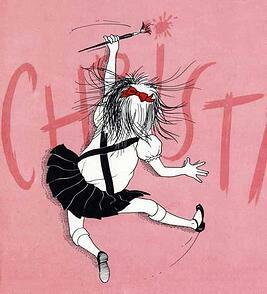 In 1969, the title changed simply to Eloise, leaving out the “grown-ups” part, but the spirit of Eloise as a both mature and juvenile girl was already set. Ever since, she has been the rare sort of character that grows with the reader, coming to mean different things in all stages of life. Eloise’s creator was Kay Thompson, a cabaret performer, movie star, and socialite with the power to command a room. She had an exuberant alter ego in the form of a 6-year-old girl—childish voice included—that she would dip into when the occasion permitted. The character was spunky, independent, and irreverent. It would become the basis for Eloise. She teamed up with illustrator Hilary Knight who brought the character to life, and together they wrote four Eloise books—Eloise, Eloise in Paris, Eloise in Moscow, and Eloise at Christmastime. The pair was working on a fifth installment, Eloise Takes a Bawth, when a frustrated Thompson suddenly scrapped the project and severed their bond. Knight scarcely heard anything from Thompson until her death in 1998. Kay Thompson, much to her dismay, knew well the appeal of her book. “People playing child” was the syndrome she attributed to her enthusiastic fans, themselves all clamoring to call themselves Eloise. In the book that started it all, we see Eloise in her natural environment—the Plaza Hotel. Supervised by a not-so-present nanny, Eloise knows how to play and to revel in life on the “tippy-top floor” of the famous landmark. This book earned a significant fanbase, including many who feel indebted to the spirit of Eloise for providing inspiration, some of them major public figures like Lena Dunham and Susan Sarandon. A first edition, unsigned, will run for about $1,500–$2,000. Summoned by her mother by cablegram, Eloise goes off to Paris, suitcase and pet turtle in tow. A major component of the book’s beauty is Knight’s illustrations of Eloise in the classic scenes of Paris, including cafes, the Arc de Triomphe, and the Champs-Élysées. Of the original Eloise books, this can be the most difficult for children, as it revels in a variety of French-language references and puns. Eloise celebrates the holiday with the exuberance she brings to nearly everything else. Here, she sings carols to the hotel guests, gives gifts to person and animal alike, and writes “Merry Christmas” all upon the walls. It is important to remember that at the time of its publication in 1959, America was well into the Cold War. But Thompson, fresh off of a trip to Russia, decided to put her precocious heroine in the land of Tolstoy. All in all, politics holds little sway over Eloise, whose capacity for fun never tires, no matter where she is. Released after Thompson’s death in 1998, this 2002 title comes from the book the pair wrote before they split and never worked together again. It shows Eloise enjoying the vast, sometimes underwater world of her bath, supplied by her prodigious imagination, all while the water leaks down to the grand ballroom of the Plaza Hotel. It is a welcome, belated addition to the Eloise canon. Of the original four books, only the first was continuously in print. With the death of their author, the books saw something of a renaissance, and today have sold over two million copies. These new editions, typically printed around 1999–2000, were sometimes printed in fine, limited edition runs. When signed by their illustrator Hilary Knight, these desirable volumes can fetch around $1,000; while many others may be found in the $400 range. Since the Eloise renaissance, about a dozen titles have been written, some of them illustrated by Hilary Knight, like Eloise's Guide to Life, extending the precocious little girl's reign in our imagination. Like Eloise herself, it seems the enthusiasm for her will stay forever young.